Situated in the fertile Androscoggin River valley surrounded by some of the highest mountains in Maine, the town of Bethel traces its origins to a 1768 grant made by the Commonwealth of Massachusetts to men whose ancestors had fought in a campaign to conquer Canada in 1690. Originally named "Sudbury Canada," in honor of these early grantees from the town of Sudbury, Massachusetts, and their campaign against Canada, Bethel was first settled by people of European descent in 1774. Long before white settlement, Bethel was home to generations of Abenaki Indians. Their main village site here was located on the north bank of the Androscoggin River west of Riverside Cemetery. Thanks to the labors of Bethel's preeminent nineteenth century antiquarian and educator, Dr. Nathaniel Tuckerman True, we know something of the lives and times of Bethel's last Native inhabitants, including the legendary figure Molly Ockett, who died in 1816. The American War for Independence slowed the settlement of this region to such an extent that there were only ten families residing in Sudbury Canada at the time of "New England's Last Indian Raid" in 1781. Following the War, however, the movement of individuals and families from northeastern Massachusetts and southwestern New Hampshire into Bethel increased rapidly, resulting in the 1796 incorporation of the town under the new name of "Bethel," taken from the Book of Genesis and meaning "House of God." Farming and timber cutting were the principal occupations of these first inhabitants, who settled near the rich intervales alongside the Androscoggin River. 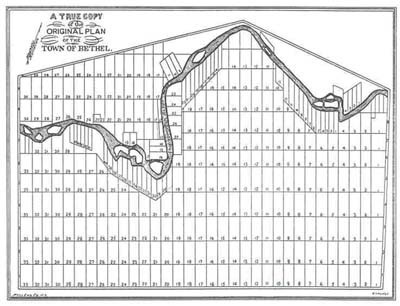 Eventually a cluster of semi-independent villages developed throughout the town, including Bethel Hill, South Bethel (Walker's Mills), North Bethel (Swan's Corner), Middle Intervale, East Bethel (Bean's Corner), Mayville, Skillingston (Steam Mill or Buttonville) and West Bethel (Gander Corner). Today, agriculture and forest-related activities remain important in Bethel, although the marginal hillside farms of the nineteenth century long ago turned back to woods. With the arrival of the Atlantic & St. Lawrence Railroad in 1851, connecting Bethel to Portland and, later, Montreal, manufacturing and tourism became major factors in the town's economy. Large summer hotels were constructed at Bethel Hill, and the town rapidly became a significant way-station for the growing White Mountain and Rangeley Lakes tourist trade. Once called "The Athens of Oxford County," Bethel has long been a significant educational center for the region. Founded in 1836, Gould Academy continues to function as one of the Northeast's premier college-preparatory schools. In the late nineteenth century, Bethel became the site of Dr. John George Gehring's pioneering clinic for the treatment of persons with nervous disorders. (William Bingham 2nd, Bethel's great philanthropist, first came here in 1911 as a patient.) Until recently, Dr. Gehring's elegant Broad Street home was occupied by the internationally known NTL Institute, which was founded at Bethel in 1947 and continues to specialize in the study of human dynamics. Culturally, the town also profited immeasurably from the efforts of William Rogers Chapman (1855-1935), impresario, conductor, organist, and composer. The founder of the Maine Music Festival in 1897, Chapman brought many notable vocalists to Bethel, including the Metropolitan Opera star Geraldine Farrar who performed in historic Odeon Hall. Through the years, a number of other famous people have had an association with the town. The list includes Alexander Graham Bell, whose wife, Mabel Hubbard, was a student of Mary True, a renowned teacher of the deaf, and Ernest Skinner, one of America's great organ builders, who was married here in 1893 and whose remains lie in Bethel's Woodland Cemetery. Since the turn of the twentieth century, Bethel has witnessed many changes in its desire to be "progressive." Indeed, over the last century, Bethel has experienced an unusual number of outside influences for a town of its size and inland location. These have affected its attitudes and inclinations, causing it to stand apart somewhat from surrounding communities. Often thought of today as merely as "ski town" due to its close proximity to some of New England's largest winter resorts, Bethel retains a unique personality, as we hope you will discover through your visit to this online exhibit and our town. Arranged in a grid-like pattern, this "lot and range" plan of the late 1760s clearly shows the narrow forty-acre parcels of fertile "intervale" land near the Androscoggin River, which were much sought-after by Bethel's early settlers. Of this plan, one early town historian wrote, "The surveyors paid but little regard to the prescribed limits of six and three-quarter miles square. They extended their survey along the river in order to include all the good interval [sic] possible, for a distance of more than fifteen miles." 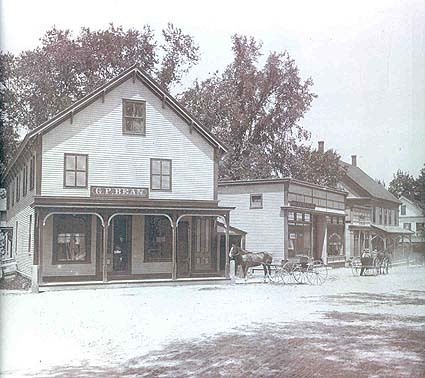 The commercial heart of nineteenth century Bethel was "Honest Corner," at the junction of Broad, Church, and Main streets in Bethel Hill village. Several structures shown in this circa 1885 photograph are still standing today. 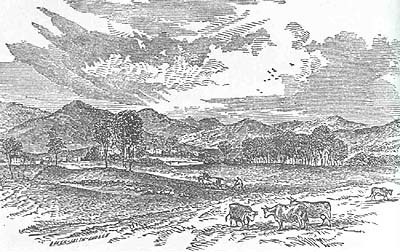 The town of Bethel is surrounded by some of northern New England's most dramatic mountain scenery, as evidenced by this engraving from the Guide Book of the Atlantic and St. Lawrence Railroad, published in 1853. Such artistic renderings greatly appealed to nineteenth century urban dwellers anxious to escape the oppressive heat and offensive smells of East Coast cities before the invention of air-conditioning.